Herrera's submission, Law Firm Incubator Study, is a "study of community or main street lawyers who people, not corporations, use as a resource when dealing with a legal issue." Studying these lawyers, she said, help legal professionals think of ways to support and provide more accessible legal services to communities that are underserved. 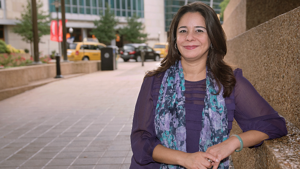 Herrera joins colleagues from the University of Tennessee, Northeastern University and the University of St. Thomas. To see a complete listing of Bellows Scholars, click here. The Bellows program reflects the ideals of Professor Gary Bellow, considered by many the founder of modern clinical legal education. When asked why the Bellows program is needed in the legal community, Herrera replied that lawyers are not generally trained in research methods; therefore, there are few groups within legal academia that support empirical research. "I was thrilled to be joining a great network of scholar-clinicians who understand the importance of empirical work and the obstacles to overcome in doing it as a lawyer," she said. "I look forward to learning a great deal from all of my peers who are already Bellow Scholars."